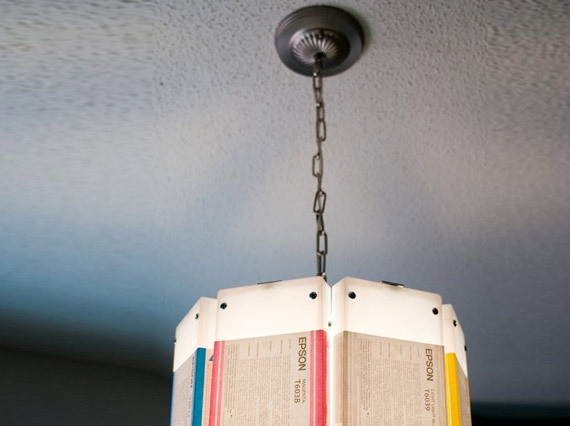 We can’t think of a cooler way to pay tribute to all of the colors of the (printer) rainbow than with this quirky chandelier made of used up ink cartridges. Lowell and Louise makes them in very small quantities using all of the ink colors: Cyan, Yellow, Magenta, Black, Light Cyan, Light Magenta, and both Grays. A custom cut aluminum bar gives each recycled light fixture a clean, modern appeal, making it great gift – especially for print professionals! We can't think of a cooler way to pay tribute to all of the colors of the (printer) rainbow than with this quirky chandelier made of used up ink cartridges. Lowell and Louise makes them in very small quantities using all of the ink colors: Cyan, Yellow, Magenta, Black, Light Cyan, Light Magenta, and both Grays. A custom cut aluminum bar gives each recycled light fixture a clean, modern appeal, making it great gift - especially for print professionals!